Stevenage Road runs parallel to the River Thames in Fulham about 150 metres from the river. No 46 is just opposite the northernmost entrance/exit to Bishop’s Park and close to the southern end of Fulham football ground. Putney Bridge (District Line), 15 mins walk. 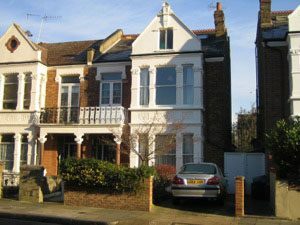 Hammersmith (Piccadilly Line), 30 mins walk. The journey from Hammersmith is best made by bus (see below) and that from Putney Bridge on foot. Both walks are best done by following the Thames, southward from Hammersmith or northward from Putney Bridge. From Putney Bridge walk diagonally left out of the station and follow a short road to a T-junction. Turn left and at a sign “Willow Bank” in about 20 yards turn right and go through a tunnel under the bridge approach into Bishops Park. Keep the Thames on your left and leave the park at the last exit by the football ground stand. No 46 Stevenage Road is opposite. From Hammersmith ask for Riverside Studios and from there ask for the riverside walk towards Fulham football ground. You have to leave the riverside at certain points on the way because of buildings but it is easy to find your way back. At the football ground leave the river and continue along the Stevenage Road side of the stadium until you reach No 46 on the opposite side of the road. Nearest buses go down Fulham Palace Road about 7 mins walk away from us. From Putney Bridge, 74, 220 and 430 northwards (ask for Cloncurry Street stop). From Hammersmith, 220 southwards (ask for Lambrook Terrace stop). Other buses (eg, 211, 295) take you part of the way from Hammersmith (to Lillie Road) and then you need to change to a 74, 220 or 430 or walk the rest of the way, about 12 minutes.